Where was the angry left when Supreme Court Justice Ruth Bader Ginsburg called the national anthem protests "dumb and disrespectful"? Let's focus on the "dumb" part. NFL player Colin Kaepernick, who started the protests, did so over the supposed widespread instances of police brutality against blacks. Kaepernick said, "I am not going to stand up to show pride in a flag for a country that oppresses black people and people of color. ... There are bodies in the street and people getting paid leave and getting away with murder." According to the Centers for Disease Control, since 1968 police killings of blacks have declined nearly 75 percent. According to The Washington Post, almost 500 whites were killed by cops in 2015, an average of more than one a day. Two hundred fifty-nine blacks were killed by the police. Most suspects killed by police had a weapon. Do you know anyone who has been struck by lightning? Neither do most people. Yet each year an average of about 300 Americans are killed or injured by lightning. That's approximately 40 more than the number of blacks killed by the police in 2015. Is there an "epidemic" of Americans being struck and injured by lightning? We don't know the number of black men injured by lightning every year, but let's assume the number is 7 percent of the total people struck by lightning, mirroring the percentage of the black male population in America. That brings the average number of black men injured by lightning to about 21. Out of the 965 people killed by the police in 2015 (as of Dec. 24), the Post reported (on Dec. 26) that "less than 4 percent" involved an unarmed black man and a white cop, the fact pattern most commonly referred to by anti-police activists like Black Lives Matter. Last year, The Washington Post put the number of unarmed black men killed by the police at 17, less than the number of blacks likely struck by lightning. Twenty-two unarmed whites were killed by the police. Any death that results from police misconduct is one death too many, but the point is that police killing of a suspect is rare, no matter the race of the suspect or the cop. And a police shooting of an unarmed black male is still more rare. But blacks are routinely and disproportionately being stopped, pulled over and/or arrested due to police misconduct, right? No, not according to numerous studies, many by the government. Take traffic stops. In 2013, the National Institute of Justice, the research and evaluation agency of the Department of Justice, published a study of whether the police, as a result of racial bias, stop blacks more than other drivers. The conclusion? Any racial disparity in traffic stops is due to "differences in offending" in addition to "differences in exposure to the police" and "differences in driving patterns." According to Philippe Lemoine, writing in National Review, a white person is, on average, more likely to have interactions with the police in any year than a black person, 20.7 percent vs. 17.5 percent. It is true that a black person is more likely to have multiple contacts with the police. But according to the data, multiple contacts with the police are rare, as well. Lemoine writes that 1.2 percent of white men have more than three contacts with the police in a year versus 1.5 percent of black men. But what about the experience of a black person with the police versus that of a white person? The DOJ's Bureau of Justice Statistics regularly studies this, too. Every year, the BJS surveys a representative sample of 70,000 people. Among the questions, the survey asks whether respondents had contact with the police in the last 12 months. If the answer is "yes," the survey asks a number of follow-up questions, including about use of force. Let's concentrate on cases involving use of force. Lemoine writes: "Only 0.6 percent of black men experience physical force by the police in any given year, while approximately 0.2 percent of white men do. ... Moreover, keep in mind that these tallies of police violence include violence that is legally justified." And keep in mind the much higher levels of crime by mostly black males. It is estimated that half of all homicides are committed by, and mostly against, black males. In 1995, the federal government looked at 42,500 defendants in the nation's 75 largest counties. A government statistician, Patrick A. Langan, found "no evidence that, in the places where blacks in the United States have most of their contacts with the justice system, that system treats them more harshly than whites." So much for the so-called "institutional racism" in the criminal justice system. Recently, in Illinois, in a kids' 8-and-under football league, the entire team, which appeared to be all black, including the coach, took a knee during the national anthem. 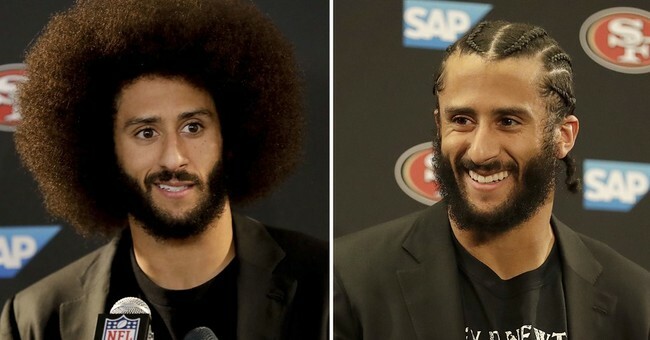 Asked why, one third-grade player parroted Kaepernick, saying, according to the coach, "Because black people are getting killed, and nobody's going to jail." Facts don't matter. The coach, presented with a teachable moment, fumbled it away.